Do you stand or sit when you draw or paint? If you usually stand, how would you feel about sitting? Why do you think it matters? When working in sight size it is usual to work standing up, and essential for a large drawing because it will be necessary to step back to make your observations. Given the length of time spent on sight size drawings it is likely that standing to draw will quickly become a thoroughly ingrained habit. When you stand to draw it is much easier to move a little way, perhaps a step or two, either side of your drawing position in order to clarify elements of form or lighting. When drawing from a model there is a relationship between you and the model, how does that relate to your drawing? When we watch sports our muscles actually make micro contractions mimicking the movements of the sports men and women we watch. It has been shown that this is so even when we watch on television (and no, that does not count as exercise!). We can use this reaction in our drawing, one way to assist this is to relate to the model’s pose, to stand if they stand, or sit if they sit. This idea helps to create an eye level that is consistent with the model’s and relates to other social conventions; to sit when others are seated, or stand when they stand. There is another more fundamental relationship to the model, one that has been developing since we were infants; the relation between sight and touch. In the beginning it is our sense of touch that trains our eye; it is why a child first draws a circle with dots an a line for a face and not triangularly spaced patches of shadow. So on one level our visual relationship to the model is also a tactile one, in the way that our sense of touch prefigures vision. What we see, and try to convey is that sense of our understanding of form. Does this relate to our drawing in a sculptural or visual mode? 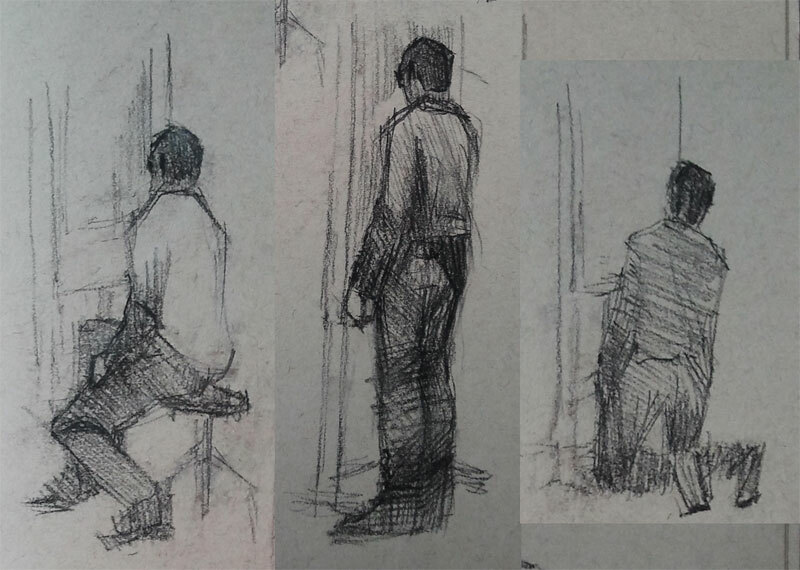 The decision to stand or sit to draw might also be governed by how your wish to portray your subject. One artist I met was making very ‘heroic’ portraits which were achieved by drawing from a very low angle to give the subject a commanding position. When you’re standing it is also easier to make large, free, gestural movements; sitting, unless you are very attentive to your body, can tend to significantly constrain your movements. I find that I tend to sit for shorter poses, often because I tend to make smaller drawings. In a longer pose comfort plays a part too and I find that standing allows a more natural range of postures than sitting still for a prolonged period of time. If I have an easel, I much prefer to stand. Somehow the easel changes the interrelationship between me, the model and the drawing. Yes, important part of getting the right action down on paper and something that is not often included in any instruction. The whole body is involved in the application of our artwork, not just the digits! After many years of architectural drawing and then rendering, I had become used to sitting in ‘ergonomic’ chairs. Not enough. Our bodies need to have some motion hourly at least. It wasn’t until I purchased a fantastic big foot-movement drawing board where I stood to draw out my perspectives, that slowly my lower back pain receded; neck tension reduced and I was stepping back to take dispationate views of my work. That all translated eventually to prepping fine art at the very same board and then later, to standing at an easel for oils. It can be tiring too, so common sense than dictates to have a break and re-energise, or lower your board and sit for a while. The combination of all this plus a circular adjustable stool, where you can also adjust spine/hip correlation has worked so well for me.Now, when I am peering closely while sitting to paint fine botanicals in watercolour, I take regular breaks and perhaps continue with work on the easel. Yes, it is unhealthy to sit for too long or indeed in any one position for long if we can possibly help it. The drawing hand and arm needs attention too as RSI is only too happy to become a permanent intruder! Don’t hold pencils/pens tightly. Do stretches and exercise as many tendons/ muscles as you can. And …this is not a physio study! It all relates though. My work has tended to be fine, small, delicate nuances with intense detail so good habits are well worth putting in place. Thanks for your comment; you make some great points, particularly about the importance of movement, the necessity to take regular breaks and to stretch. I have residual neck problems from ‘driving a desk’ for too many years. It is so easy to get caught up in your work and realise that you have not moved for several hours! Sight size techniques seem to have a particular effect in tightening my hamstrings and lower back. I found Yoga and Alexander Technique to be very helpful, both in terms of working out the kinks and improving my awareness of my posture and movement. I am glad to hear that you have found a good ergonomic set up that works for you; my set-up is still a work in progess! Hi Im so glad that these issues have been raised. I have an upper shoulder blade problem(having suffered a frozen shoulder for 3 years) and lots of pain and need to walk around and have space to draw and be in a relaxed atmosphere.I usually work in charcoal and use putty rubbers to work but now have such weak upper arm muscles and wrists and will have to adapt my working methods. Any suggestions. Thanks for your comment. I’m sorry your shoulder is giving you so much trouble! After 3 years I guess you have tried all the usual medical/physiotherapy options? Hhhmmm, suggestions, first I’m not a medical professional of any kind but if it were me I would try 2 angles: firstly rehab with a physio and/or specialist theraputic yoga teacher to help rebuild your muscles, although you may have tried this already. Secondly from an artistic standpoint an Alexander technique teacher could work with you on your posture and movements at an easel and whilst drawing. In terms of materials and techniques perhaps some low-impact options that require you to exert less force and allow your arm to remain in a more neutral position (if that helps?). You could try using a charcoal holder or stick this could allow you to make smaller movements, a small piece of chammy leather is very effective eraser and requires only the lightest touch, although it can be a little tricky to control. Oriental ink/brush techniques also require very little force and a calm approach that may be interesting to investigate but this would be a larger change from your charcoal work. Charcoal powder too might be worth a try (beware the dust though). Experiment with as much as you can to find what suits you, your willingness to adapt maybe the hardest step! I look forward to catching up with your experiments. Hallo Helen sorry to have taken so long to reply.Thankyou so much for your advice. The chamoix leather has made all the difference, plus the soft putty rubber, I can remove the areas I need to to create softer more subtle surfaces with much less physical effort. Exciting changes. I will try the charcoal holder.I must try the ink perhaps for shorter studies. Thanks for the update on this one! Happy to hear that timed working has helped too – I find it helps me to be more productive with other things too, as it’s easier to focus on something specific for a short time. Great news too that you have had some success with Alexander Technique. Chammy leather is available from most DIY shops, B&Q, Homebase etc as well as high street hardware shops like Wilkinson. It is usually near the car wash products. I’ve gone back and forth. If I stand, I make sure to where running shoes and also have a small crate to put one foot up on. This helps with tension that forms in my back. Standing can be so much better as long as I am energetic and moving. For much of the time though, I find myself standing very still for a couple hours and then tension forms. Sitting on a high stool, just barely on the seat has been my favorite. I can easily move from the stool to step back and check my progress. Hi Helen, Just sent a message via your website. I life-draw. I stand at my easel. I draw in pencil (graphite sticks) on A1 220gsm cartridge paper. I have a pencil in each hand and I draw with them simultaneously. Each contributes equally to the mark-making process. I feel my whole body and my whole mind and my whole feelings are involved. I have written about this on my blog. If you have time you will see I have frequently described, commented on, analysed my two-handed drawing approach. Can’t find anyone else who does it like me. Any ideas? It is now my natural way to draw! Looking forward to any comment or observation you may have. For now, love and best wishes from ‘two-handed-bob’.